I do want to credit American Airlines for handling the change of flights well. After the mechanical problems on our flight from Honolulu that made us 4 hours late, there were rain delays in Dallas that pushed the next flight to BWI back by 2 hours. 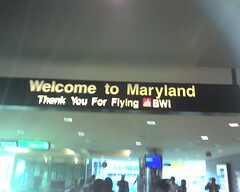 But, they were able to get us on that flight (sitting together) and all of our luggage made it to Maryland. But... After our flight from Dallas was pushed back another half hour, we boarded the plane. And then we sat there for another hour while they loaded luggage. The pilot (or someone) told us that they didn't know if it was the weather or a bumpy shift change, but it was taking a lot longer than normal to load the luggage onto the plane. But wait... it doesn't stop there! As we got to our seats, we noticed there were a few kids nearby. Now, I try to give parents the benefit of the doubt when I see kids on a plane. I've been on many flights where the kids are well behaved. Not this one. Two rows ahead of us, there was a little one (that was learning to talk) that cried. A lot. Immediately behind us was a mom with a little boy and a little girl. And an infant. I believe daddy was another row back. All three kids were constantly hitting or kicking our seats. Constantly. For 4 hours (1 hour for luggage + 3 hour flight). And the infant kept screaching. Constantly. "Shhh" is not good enough, mommy. On top of that, the woman sitting on Holly's right was sick. She coughed and sneezed and blew her nose throughout the flight. I sure hope Holly and I don't get sick. But, as I said, all of our luggage made it to BWI. Glenn was right at the curb to drive us home. And we had two happy puppies and a happy kitty waiting for us at home. They're definitely happy for us to be home. And Sydney's OK. We're going to watch her for a bit, but we think she's fine. And, our trip ended was a great find. During the confusion with me having the flu and Holly having to pack everything, there was a suitcase switch (Holly moved her stuff to a smaller suitcase since her big one was not very full). In Hawaii, Holly noticed she didn't have her jewelry case with her. She normally packs it on a carry-on. We thought it could have slipped out of her bag during the security check or in a plane when getting something out of her carry-on. But, luckily, her jewelry was in the suitcase she didn't take (at home)!